More Elm Creek Quilts is the prize being shown today. This is a beautiful book by Jennifer Chiaverini. Today you will need to leave your favorite recipe on the comment form!!! How fun is that? Everyone will be able to have some new recipes to enjoy this summer. Make sure you read "Giveaway Rules" so you know how to win!! Hi again. Since we've last visited the Tooth Fairy has visited. Aaron is completely surrised that the Tooth Fairy would know he was on vacation. But she knew and he's thrilled. Ok....just a reminder here. Here is how the giveaway is going to go: I will draw a random number 1-9 (one for each days gifts) then I will draw a random number between one and the number of comments for the day. So you could have commented on Monday but win Friday's gifts. Get it. So be sure to leave comments each day. No one said I would go back and check the time stamps so if you missed a day....what the hoodle doodle....just go back and leave a comment with the day's requirements. Have fun and don't be like me.....keep the secret of the giveaway to myself so I have better chances of winning.....go ahead and let others know too. No pix to upload today.....I'm in the boonies and the camera is in the doonies. You have an opportunity to win "Dear Jane" book by Brenda Manges Papadakis. This book is amazing...it has 225 patterns for a Dear Jane quilt. There are so many blogs that just talk about Dear Jane quilts....they are so beautiful. If you want to win a prize for this weeks giveaways please be sure to leave your e-mail in your post. If for some reason your computer does not allow you to leave comments feel free to leave your comments on my web site and I'll include them in the giveaway. I'm here in Wyalusing at our Cabin and I had to drive into town to find a wireless connection. I can't believe I even found one. Ever day for 9 days there will be giveaways on my blog. Please tell all your friends and groups so they have a chance to win too. I can only get to moderate the comments once a day. You may not see your comments until I get to posting them. Don't be discouraged if you don't see yours right away. You have a chance to win this brand new pair GrabARoo's (size 7) and a Square Dancer pattern by Mountain Peek Creations. I love these GrabARoo gloves. They are great for free motion quilting and a host of other things too. I gave a pair to my mail carrier and he was thrilled. I love to scrapbook and when I use these I don't get fingerprints on my pictures!!! Woo hooo :) The paper and pictures are easy to pick up too. The Square Dancer pattern was given to me at Quilt Market by the gals at Mountain Peek Creations. They were sooo kind and generous. I thought I would share this beautiful pattern with a lucky winner :) I hope that winner is YOU!!! I'm sorry it is so late in the day but this is the first chance I've had to sneak away and post to my blog. I promised a giveaway each day that I am away. There will be 8 days of prizes to win. To make it even more fun, you won't know what you are winning. I will post a picture each day of a prize that will be drawn for at the end of the giveaway. So, I will randomly select one person's comment from that day and then a random number for the prize. Please keep in mind that some of the books or patterns were floor samples so they are not exactly new....but in great condition. For example, the envelope on this Valori Wells pattern has a small tear. It is a brand new pattern and never has been used. Just a small flaw so I can't sell it at full retail. To win today you need to leave a comment before midnight about the most famous person you have ever met and the circumstances under which you met them. Give the juicy details.....but keep it PG or close to it :) Well....of course if you have slept with Robert Redford then I guess you could spill the dirty beans. What wonderful photos and what sweet boys. Imperial skills??? What a riot!A week of giveaways sounds like a fun week! As for today's answer, I have no idea, but because you said that it was taken in PA, I will guess that they are MJ's shirts. One person guessed correctly. They belong to MJ....the "Bag Tag" designer :) Susan gets her choice of two bag tags or what ever she can talk me out of :) Now that's not a really difficult challenge....I love to give things away. I've gone through all my Quilt Market stuff and more books that were Floor Samples (not used but not new....still great)....all to give away starting Saturday. Every year we head to PA for the 4th of July. The only difference this year is we are going the week before and leaving on the 5th to return home to OH. We look forward to this trip all year and enjoy seeing our friends and family. I adore this picture. It was taken in PA in July. Can anyone tell me who's shirts these boys are wearing? You have to recognize the shirts owner and not be the owner....hey owner....no telling....that's cheating!!! The Cabin....ahhhhhh our retreat away from everything....no electricity or running water. Rick and his family built the cabin in 1983. The boys love to go to the "house cabin." Speaking of the boys...one quick funny and I'll get right back on topic...I promise. Tonight Aaron, Zach and I are in the backyard trying our best to catch fire flies. Aaron looks at me very seriously and says, "Mommy it takes imperial skills to catch 4 fireflies in one jar." Imperial skills? You just have to love that one. I thought it would be fun to do a week of giveaways....one each day I'll be away. Does that sound like a good idea? The pattern was designed by my dear friend Mary Jane. -Clear Plastic 2 1/2 x 4 1/4 inches - you can get this at Wal Mart (if they have fabric) or JoAnn's. I use Best Press and iron my fabric. I like my fabric to be wrinkle free. Then I cut a piece of MistyFuse just larger than my Timtex (I eyeball the measurement). It might be difficult to see in this picture but if you look closely you can see it is about 1/4 inch larger all the way around. Then I lay my wrinkle free fabric down, put a layer of MistyFuse and then my Timtex. I trim the corners of the fabric off - freehand-does not need to be exact. Now I flip it over and press the sides in first. Next, I press down the ends. The extra MistyFuse is not visible here (it is wonderfully thin and leaves you fabric soft not stiff) but that is what holds the fabric in place. No need to use more or cut more it is already there. Then I press in the "ears"
I fold it in half and press again. I use my new Bias Tape Maker to make the straps. I cut my fabric 14 x 1 7/8 inches. You can do it the old fashion way and fold your fabric in half, then fold the edges in and press. You can use the Bias Tape tools by Clover too. What ever works for you. This is just how I do it. Just lay the fabric over the roller. I cut it on an angle so it fits through the tip easier. Top Removed....fabric comes across the plate and over the end roller. Note: you need to get the fabric over the end roller. Replace the top, turn it on-it heats up very quickly. (this picture was taken out of order. I take mine off first before feeding it but I also turn mine on and do it carefully. If you follow my lead....you can get burned....YIKES. Danger Will Robinson!!!! I fold it in half and stitch down both sides. The stitches should be even....often my boys are playing next to me and I'm talking to them and not watching what I'm doing exactly. Then you get a wobbly line....I'm not thinking the bag handlers will notice....do you? I tuck my strap in half and edge the tips down into the Bag Tag about 1/2 inch. The next few pictures relate to the cutting of the plastic. This is just how they got uploaded....You can cut your plastic at the same time you cut your fabric. Because I had such a hard time seeing the edge of my plastic when I cut it I use these Q Tools Cutting Edge Strips on the edge. You can see here that I place it on the edge of my roll of plastic. Now I can see where I'm cutting. This just makes it easier for my. You might not have a hard time seeing the plastic. I have these strips for my rulers and they are re-usable so I use them on my plastic too. First I stitch right along the edge of the strap securing it in place. I usually go forward and backward and forward again. This secures the strap into the Bag Tag. Just as I turn to come down the side I place my plastic on top of the Bag Tag. It is a little difficult to see here but that is what I've done. I use my walking foot because it glides over the plastic and does not get stuck. I've used my 1/4 inch foot and it sticks to the plastic. I continue stitching all the way around and then clip my threads. Then I put a business size card behind the plastic. You can make an assembly line to make several tags at once. They make really great gifts. Everyone I've ever given them to has told me how much they appreciate them. I put them on my boy's back packs for school, lunch boxes, gym bags and my luggage. I have made them in smaller sizes for gift tags and then they can use them for their bags afterwards. This tutorial took quite a bit of time to do the pictures, upload them, write out the tutorial etc etc etc. I did not share the pattern (which took MJE time to create) without her permission. I ask that you not copy my instructions without my permission. The pattern and instructions are being shared freely and not intended for sale or profit. I would love to see your Bag Tags. If you make some please, please, please send me pix to share. Link to entire slideshow staring "Helga"
I happened to stop at an estate sale this past weekend. 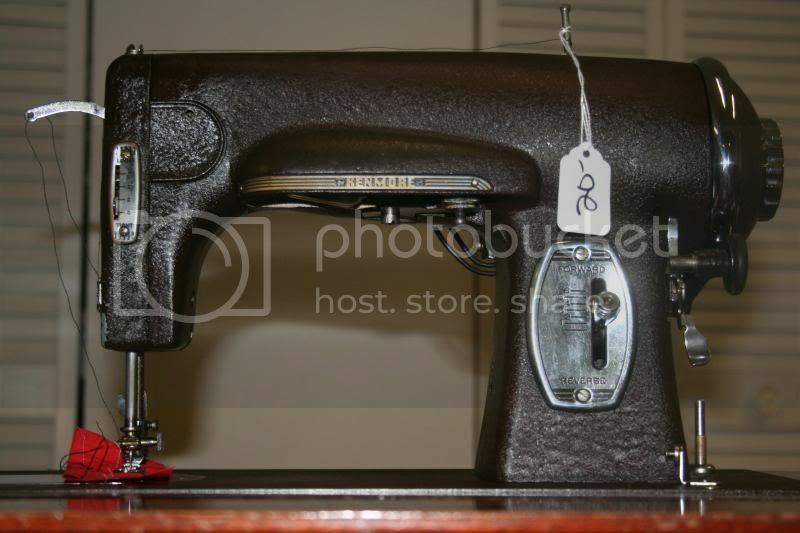 I saw this sewing machine and wondered why it was 20 dollars. The sale was coming to a close and I was surprised it had not been purchased. I asked the gal if it worked and she said yes it does so I bought it. Surprisingly I did not even ask her to sell it for 10 or 15 dollars. No haggling necessary....I just signed the adoption papers (she accepted credit cards too!!!) and brought Helga home with me. I wish I had a video camera turned on when my husband saw the sewing machine. He had such a puzzled look on his face. He asked me why I needed another sewing machine and he was serious. He honestly had no idea why I would buy another sewing machine. I loved the treasure hunt that followed. I opened up all the drawers and found so many fun items. Snaps for .23 cents, wooden spools of thread for .25 cents. The oil bottle looks to be the same age as the sewing machine and I just love it. I'd say that was 20.00 well spent. What do you think? Free is one of my favorite words, followed closely by Food, Friends, Fun, Flowers, Freckles, French Fries, Feather Pillows, Floating, Freesia, Fudge, Fire Flies, Freedom, Frogs, Fountains, Fall, and Foliage....just to name a few. You know how I'm always posting pictures and saying sorry the quality is not what I wanted it to be? Well I just found free online classes in digital photography by HP. I thought I would share this with everyone else who would like to improve their digital photography. Just thought I'd share a freebie with ya. With the kids being home for the summer I don't get much time to sew. I have lots of ideas and desire but not enough time to sit and focus. No complaints, just a fact of life for now. Boy I sure do have lots of projects on my list as soon as Sept. comes around. Both boys will be in school and I'm hoping to get into some of my larger projects. My mind is not in the blogisphere lately. My dog Bear is not doing well. We plan on taking him to the vet to be put to sleep on Friday. He has been my dog since before I met Rick or had the boys. He has always been a special part of my life. I'm sharing this so folks aren't wondering why I'm not writing about stitching. So if I miss a post or two....you'll know whats up. I have a dear friend who had to put her dog to sleep and she called me from her car on the way home from the vet. She was crying and feeling terrible. I said, "So you are telling me you just killed your dog and you feel bad? I'd feel bad too!!" She started laughing and told me she was glad I had not lost my sense of humor. Have some fun today.....and leave a few chores undone!!! This has been the hottest item in the last week. I've received several e-mails asking about the tips sizes that will be available. So I thought to save myself lots of time answering e-mails I would publish the tip sizes that will be coming in Aug. (according to my sources). The tips for single fold bias tape will be: 1/8 1/4, 3/8, 1/2, 3/4, 1 1/2. The Quilt Binding tips will be for 2 1/4 in and 2 1/2 in cut strips. If you would like to see how the machine works click here. I got a sneak peak and a test run back in April. 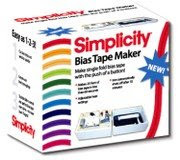 The Bias Tape Maker comes with a 1 inch tip. The additional tips will be for sale individually in Aug. I hope this helps explain the questions. For those of you who are artists these ideas come naturally to you. I need some guidance with to get comfortable using something new. I think that comes from not wanting to ruin something or waste my supplies....who knows. I was struck by the colors and the designs that can be made. Obviously they can be used to paint on fabric. If you are like me and don't paint, stencils and rubbing plates are a great way to get beautiful designs on our cloth. I love the leave pattern used for the quilt above. These would make beautiful additions to jackets, purses, t-shirts, floor cloths anything you can think of with cloth. Someone at Market said she was going to stencil the side of her suitcase so when she is at the Airport she'll know what bag is hers. Oh yea baby....can you imagine the conversation starters there? If anyone wants to do my suitcases.....come one over :) I want to make a floor cloth using the Paintsticks. I bought the DVD for Paintsticks called, " Paintstick Inspirations with Laura Murray " and I love it. I'm a visual learner so DVD's have always been one of my favorite ways to learn new techniques. It is also a way to get the TV to myself. My boys don't want to watch "grown-up TV". Life had been full with the start of Summer. It feels like I go from sun up until well after sun down. I've been doing lots of planting in our yard. Rick & the boys have put in a garden. The boys have a full time job of chasing away the bunnies that come to eat their garden. Do you have a project you are working on that you would like to share? E-mail me at IHaveANotion@yahoo.com I'd love to see it/them :) If you are open to sharing I'll post it on my blog too!!! Michelle P. from AU is the winner of the Piecing with Pixels book. Congratulations Michelle. What a great week. Zachary and I both earned our advanced white belts in karate. Aaron earned another stripe on his advanced orange belt. My family came to visit , I met lots of nice people and got some great deals at garage sales. Can't beat that with a big stick!! I went to some garage sales on Friday morning and Saturday morning. I got some great buys. I fell in love with these dishes the minute I saw them. They have never been used and there are 16 place settings, two platters, two serving bowels, two sugar bowels & creamers. Guess what I paid? Then I found this quilt stand in the box....unopened. It had never been opened and it required assembly. The stand is made of oak. What do you think I paid for it? I checked on line and it would be 49.95 plus shipping if I were to order it. There was a high school reunion (small gathering at a restaurant) on Saturday night. This was my first gathering with "kids" from of high school. Rick and I both had a ball and I'm really glad I went. Rick's birthday was Sunday and we spent the day discovering some lakes about an hour from our home. We ate lunch at a cozy restaurant and took the boys to play in a park. Later we grilled steaks and had cake and ice-cream. Ok.....I guess I better tell you what I paid for those items so my phone does not ring in the middle of the night. The dishes were $35.00. They had them priced at $45 and like the nut I am, I asked (with a straight face) will you take $35.00. I could not get to the van fast enough with those dishes. Best yet, Rick really likes them too!!! I paid $5 for the quilt stand. Woooo Hooooooo!!!! I also got a brand new Creative Memories Picfolio Album (something I wanted) brand new in the box.....for $1.00. So needless to say....I am a thrifty shopper and I love a bargain. For anyone who has not had a chance to participate in the Giveaway....please do so by midnight for an opportunity to win. If you don't know what I'm talking about....go Monday's post and read about how to win. Get TEN 45 mm Olfa Rotary blades for only 31.99 plus postage. To get this great price become a "Follower" of I Have A Notion Blog and you are eligible to purchase replacement blades at this special price (3.20 each instead of the usual retail of 5.00 each). If you want to take advantage of this offer you must enter your order via e-mail to IHaveANotion@yahoo.com and not through my website. That way I will know you are a follower of my blog. If you are not a follower and would like to be....click on the Follower button on the right hand side of my blog. There are many talented gals in this guild and their quilts were all really great. Three in particular struck a cord with me personally. This quilt is really amazing. Jennifer Moilock (I pray I'm spelling her name correctly.....if you click on her name you can see her blog and more about her wall hanging) made a portrait quilt for her parent's 50th wedding anniversary. What an incredible gift to be able to give her parents. Her mother was there last night and she is in the picture with Jennifer. Isn't this something else? The pearls sparkled and the veil was just a great addition. The sentimental value of this quilt makes it uninsurable I'm sure!!! Jennifer with her mother, Rita, holding the portrait of "Ron and Rita Trumbull"
Sheila Painter with her quilt. It was machine quilted by Rhonda Kistner. Sheila is entering this quilt in the Kaleidoscope of Quilts. She collected veggie fabrics and made blocks for 4 years. I really liked the creativity and the bright colors in this quilt. The paper piecing is just great. There was another quilt that jumped at me but I was not able to chat with the gal who made it. It was a quilt made from a photo of a cardinal sitting in a tree. When I see it again I'll ask if I can post it on my blog. It was really beautiful.